Get going with Degree Apprenticeships with our ten top tips! Degree Apprenticeships are still a reasonably new innovation, but have already been delivering real impact for employers over the last two years. If you are not sure where to start with Degree Apprenticeships, hopefully these ten tips will get you started. Look at your business holistically and think beyond your core operations. Might you need also need skills in areas such as marketing, IT or general management? What new resources will you need in order to hit your business objectives in 1, 5 or even 10 years’ time? Can you utilise degree apprentices to play a role in your resource planning and to address any future skills gaps? Take a long-term view. Make sure you develop a clear understanding of the funding you are eligible for and how you can maximise this to meet the needs of your business. Recent funding changes mean that SME employers not paying the Apprenticeship Levy (annual payroll below £3 million) can benefit from a minimum of 90 per cent funding for apprenticeships and in some instances will have to pay no fees at all. There are also extra incentives of £1,000 for taking on apprentices under 19-years-of-age. Research the types of degree apprenticeships available and whether these would be suitable for bringing in new employees or to help upskill existing staff members. Utilise our specialist knowledge. The Degree Apprenticeship landscape is rapidly developing so we are able to give insight into what new programmes may be in the pipeline. Since 2013, all new apprenticeships have been created by groups of employers, so if you feel there are job roles that are not covered by existing Degree Apprenticeships you can get involved with the process of creating new ones. Promote the business benefits that taking on apprentices will bring, i.e. utilising available funding, bringing in fresh innovation and creativity, meeting skills needs and high employee retention. Having the enthusiastic involvement from all areas of your business will create the best environment for apprentices to thrive and make an immediate contribution. Contrary to some beliefs, putting support in place for apprentices doesn’t need to be time consuming or complex. Maybe think about which members of your team have excellent leadership skills and could be best placed to develop an apprentice. Manchester Met offer a half-day training workshop for line managers of apprentices, free to all our partner employers. Time is precious in business, but degree apprentices really deliver value for that time investment. Prepare advertisement dates, application criteria and assessment centre/interview dates as early as possible to help access a large talent pool of high calibre applicants. At Manchester Met we advertise partner vacancies on our website and organise regular apprenticeship open evenings, to bring employers and potential candidates together. Remember the peak months for Degree Apprenticeships applications tend to be from March to June, for a start date in September. Have mechanisms in place that assess the applicant on a range of their skills and behaviours and look at more than just grades. Offer a competitive salary to attract the best candidates. As well as being as being a fantastic way to recruit bright new talent, Degree Apprenticeships can be a brilliant way to utilise generous funding to develop your existing employees to a graduate level. 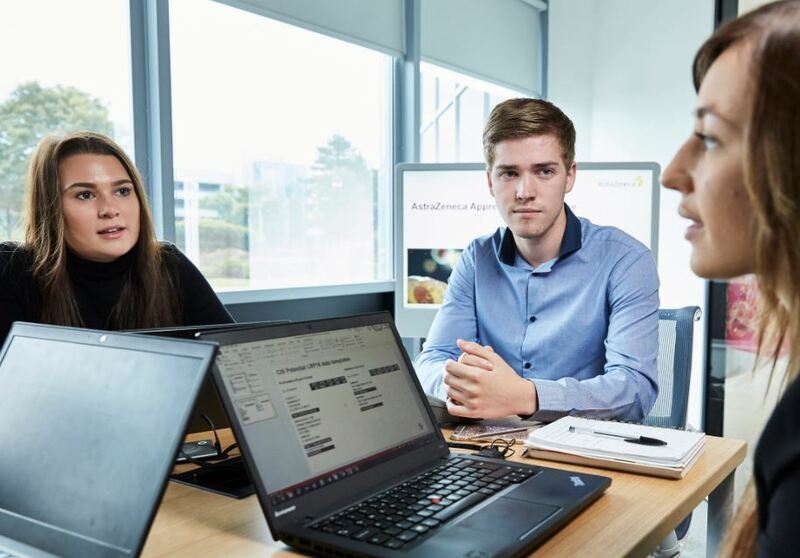 Build a work programme for apprentices that will give them the most opportunity to develop the breadth of skills your business needs and gives them the platform to put their academic learning into practice. Rotations across your business might be an effective way to build a strong foundation of knowledge and expose them to different business situations. Don’t be afraid to challenge them or give them their own areas of responsibility. This gives them the chance to maximise their potential and employers are often amazed by the capabilities degree apprentices display in only a short amount of time. Degree Apprenticeships are very different in nature to regular undergraduate programmes. Whenever possible we will give apprentices the opportunity to work on real-life business challenges and scenarios. We will work withyou to make sure your apprentices are making the most of these opportunities and adding the maximum value to their academic learning. Also, give regular feedback on things that are working well or not so well, as we will, where practical, make changes. Degree Apprenticeships are now in their second year and many employers of all sizes have decided to get involved. It is not a complex process and the business benefits of employing apprentices are proven. Ninety per cent of employers with apprentices report benefits and businesses with apprentices typically experience improved productivity. Get in touch with us to start your Degree Apprenticeship journey.